Biking is dangerous. I'm pretty sure that you've heard that just about every time you hop on your bike. If you also happen to have a kid or two in tow, you probably hear it from just about everyone you pass. Just the other day, I got yelled at by a woman who had been speeding up to a red light, trying to get in front of me. "You better be careful, you got babies in there!" I told her that I was being careful and that she shouldn't speed. Her answer was that she wasn't going to hit me but she didn't see my trailer. I've heard that more than once. I'm still not sure how people miss it--it's big, yellow, and has two sets of flags with pinwheels on it. The truth is, they're NOT LOOKING. Few people expect to see trailers with kids on bikes, their brains aren't wired to see us. Besides, we're lucky if drivers are even half conscious of the road. How many drivers do you see on cell phones? That doesn't even take into account how many people think it's okay to drive under the influence--of drugs, alcohol, exhaustion, distraction, and on and on. It's pretty darn scary to think about and probably the reason more people aren't out there enjoying their bikes, sadly enough. 1. Helmets--All the time, every time, everyone. Properly fitted and not expired. Parents, use them and set a good example. I'm not even embarrassed that Lennon feels the need to point out everyone NOT wearing helmets on bikes. Personally, except for the crazy hair, sweat, and funny tan lines, I don't see why people don't wear them. It can't hurt but it might just save your life. 2. Follow traffic laws--Includes riding with the flow of traffic, using hand signals, NEVER assuming we have the right of way or even that drivers see us. 3. 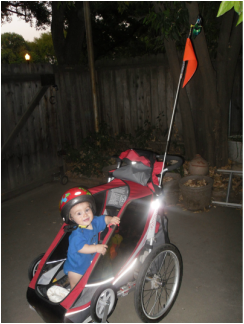 Get noticed--Use light colored clothing, safety flags, lights, don't hug the side of the street or ride in the gutter. I like to give a friendly "thank you" wave to drivers who have been especially cautious and courteous. I think it helps remind cars that we are human. 4. Be aware--Turn your head, use a mirror, take out those earbuds. Just assume that everyone is out to get you--the lady in the parked car, the dog off the leash, the signaling left-turner across the street, and the speeding kid coming up too fast behind you with too much bass booming. Somebody has to be paying attention on the roads and we are the ones with the most to lose. 5. Use proper equipment--I have seen babies on dad's back strapped into hiking backpacks racing down the bike trail, kids that are too small to be in trailers or barely hanging on to trail-a-bikes while their parents are oblivious to their discomfort and/or ability, kids roaming freely in the back of a trailer without being buckled or wearing a helmet. You can get used biking equipment in good shape for a good deal, online or locally. Do some research and find out what is appropriate for your children and don't skimp. Be patient and wait for them to be ready to ride, don't rush it. If you want your kid to enjoy biking, keep them safe and keep them comfortable. Make sure your bike is in good condition and the brakes are strong (it takes longer to stop while carrying a load). I just installed a rearview mirror so I can check on the boys and keep an eye out for traffic sneaking up behind us. Have I mentioned helmets yet? 6. Find safe routes--Bike trails, bike lanes, sidewalks if necessary. Google's bike routes have been hit or miss for me so don't trust that they are the safest. Bike shops usually have great maps of the area and local rides. 7. Safety in numbers--If possible, ride with others. I like to have someone ride behind the trailer in traffic. Surround the babies! 8. Common sense--Use your brain! If there is a dangerous section, use the sidewalk (walk your bike if laws/safety necessitates), don't ride at night with children unless you are properly lit up like a spotlight or better, be prepared for emergencies and breakdowns, ride sober. Disclaimer: This is just what worked for us. There are many schools of thought in regards to babies on bikes--ranging from worries about "shaken baby syndrome" to the carefree "just strap in the carseat" mentality. Talk with your pediatrician and use a huge amount of care. Biking is dangerous but so are hot dogs. Weigh your options and use common sense. I talk more about touring with babies here and here in more detail on the travellingtwo.com site. Big Brother was about six-months-old when we started him off in a single Chariot Cougar, found for sale on Craigslist.org. I did a ton of research, and looked at bike seats vs. trailers and all the various brands of trailers out there. I wanted a trailer because we like to tour and go for longer rides. We settled on the Chariot because it has suspension to minimize the amount of vibration felt. It is incredibly versatile and well-built. I love the stroller wheel attachments and useful accessories. They hold their value well. At first we did short loops around town to get a feel for the trailer and how Lennon would handle it. Most often he would fall fast asleep almost immediately. A few times, he screamed. As he got older he would just hang out and watch the world go by. It became apparent quickly that he was pretty darn content in his Chariot. He had his toys, some books, blankets and he was good to go, crying only when he needed to be fed. We were able to take him on a 600 mile bike tour around Oregon when he was just 10-months-old. It was amazing! He was amazing! The few times he cried, usually at the end of a long day when we were all feeling about the same, I had to keep reminding myself that babies cry when they're in carseats, too. When there was a clear, safe place to pull over we would do so, but sometimes we couldn't do anything. It happens. He wasn't being tortured but it sounded like it to passersby. Jose even tipped him over once and, except for being a little shaken up, he was unscathed. However, he still loves his trailer and is a happy, healthy, well adjusted kid with no sign of brain damage or irrational fears of crashing. Little Brother started in our new (used, Craigslist) double Cougar Chariot. Their Baby Support is wonderful. It gives him extra support and the headrest can be removed to make room for the helmet. My babies wear their helmets every time, no question...it's just what we do. It is pretty nice to have Big Brother in the trailer to help, but I do have to remind him to be careful with the little guy. Mostly, they giggle together until Little Brother falls asleep on Big Brother's shoulder and Lennon watches out the window and reads books. Awesome hat to cover the helmet hair as you're hopping on and off the bike for those 2-milers. Our plan is to replace as many of our car trips as possible with bike trips. But most people I talk to about our project look at me like I'm crazy. They like what we're doing but could never see themselves giving it a go. They don't know that the hardest part is just getting started. It helps that we were bikers to begin with but that doesn't mean that it is impossible for a regular Mama-minivan to give it a shot. My best advice, start with the 2-mile challenge. Take one of your regular short trips and find an alternative way to get there. As you slow down, you'll start to notice things you have never seen, smaller roads, quieter streets, bike lanes. Enlist a friend to help. Safety in numbers, of course. Use your Saturday or Sunday morning to plan your route to work/school/the park. Biking requires a little more preparation than driving, but the benefits are worth it. Two mile trips don't even really take MUCH longer to get there. If you don't believe me, time yourself from the moment you walk out the door to when you reach your destination. Car vs. bike, within 2 miles, it's pretty close. Those trips begin to add up and as you get more confidence on your bike and start to learn the safer and calmer routes, you'll begin to enjoy biking as transportation more and more. Take the challenge and have some fun. You don't have to ditch the car yet, just leave it parked a little more often. Ride for a reason! Couldn't have said it better myself. Everyone needs a local bike shop. One that knows their name and their bike. One that can direct you to exactly what you need and one that steers you away from that which you don't. Finding your LBS is a bit like dating. You may need to try a few out before committing. It is important to find a place that is able to give you personal attention and knows what they are talking about. Run as fast as you can away from the shops that steer you towards the all-carbon, slick road bike when you have said over and over that you want an upright commuter with fenders. Don't let a shop oversell your needs. If you are just starting out, a good shop should be there to hold your hand, not just your wallet. An online/big box store will never give you free labor as they chat with you about your latest ride. They won't special order tires then throw in an extra tube because they worry that you don't have a spare. Obviously, helmets are important to me. I am a firm believer in wearing helmets and, to me, it's as natural as putting on your seat belt in a car. However, I had a great email conversation with Friedel of the Travelling Twos, an amazing resource for bike touring. She was very interested in my conviction about wearing helmets. In the Netherlands, the main Dutch Cycling Union has a campaign to actually ban mandatory helmet laws. The idea behind the ban is that helmets give cyclists a false sense of security and they create fear in riders that keeps people from cycling. One point they make is that more deaths are reported each year from "accidental falls" than bicycling. With that mentality, helmets should be mandatory for walking down stairs, not for bicycle riding. Hardly anyone, including children, wear helmets. Cars are respectful and responsible, there are numerous bike paths, and the country is quite flat. The majority of Dutch cyclists actually said they would stop biking if helmets became mandatory. With "safety in numbers" needed to create a healthy riding environment, you need as many bikes out on the roads as possible. Sadly, I still believe that helmets are imperative for riding safely in the US. We do not have the strength in numbers or the appropriate government backing and infrastructure. On one hand, people are trying to pass legislation mandating essential cycling needs such as having cars give, at least, a 3 foot berth when passing. How many times have you been narrowly passed, possibly even hit by a car trying to squeeze through or had to ride in a cluttered gutter due to a lack of shoulder space or marked bike lane? Others on the opposite side of the spectrum are actually trying to ban children from riding on bikes until the age of 6!! The very basics of cycling are lost in our car-culture, fear-driven society. Until we can get past these issues and educate our citizens on safety, both on the bike and in the car, it's not surprising that there are so few riders willing to get out into traffic. From 2000 to 2009, Sacramento saw a 50% increase in bike commuters. That sounds pretty amazing until they also point out that the percentage of riders jumped from a whopping 1.4 to 2.1 in 9 years. Another consideration is the difference in the Netherlands's policy is their strict liability. This video explains it perfectly. In every case, if a car hits a bike, the driver is always at fault. If a bike were to hit a pedestrian, the bike is at fault. This makes people a lot more cautious. I like how the narrator in the video says that the driver has to be aware that they are driving a machine that can kill. That is something that I believe we have forgotten, at least until we are reminded. As Friedel says, "the law favors the weakest people on the road." There, it is much harder to obtain a driver's license and people take driving much more seriously. That is a stark contrast from the US where we let teenagers on the road before they are legal to drink or to vote (not that that stops them from drinking then driving, either). Here, it can even be argued in court that if a cyclist was not wearing their helmet, they are showing reckless behavior and therefore, could be deemed at fault. One more example of the "blame the victim mentality." It does not help to take children off bikes if you do not first teach drivers to not hit them. I cannot wait for the day that cycling in the US is seen to be as safe as walking, as it is in the Netherlands! It is so sad to me that most people in the US are so ignorant of cycling safety that I really feel it is very dangerous here and, right now, helmets give me a small sense of security in an otherwise scary place. I LOVE the "Dutch way" and, hopefully, getting more people on the roads will show drivers that we are here and help them learn how to share the road. Then I would be happy to cruise around helmet-free. I will remember that when we go to visit the Netherlands we can leave our helmets at home.